October = Halloween = horror! 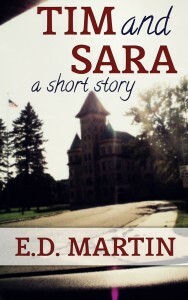 Here’s a snippet from “Tim and Sara,” about two friends who escape from a mental institution. In this scene, Sara has busted them out and trying to talk Tim into not having another episode like last week’s. Can’t mess it up for Sara (messed it up for Ellen for Paul for Mama where’s Mama no sign of her just blood just Paul’s hand Ellen on the floor). She shakes me, and I nod. Find out more about Tim’s and Sara’s demons by getting your copy on Amazon. Then post a link to your eight sentences blog entry, or join the fun at the Weekend Writing Warriors website. OMG, what have we here? Two broken people, one more than the other. ED. you’re a wonder. Spooky (inagoodway) how you can put us into the mind of a mentally disturbed person so smoothly through the use of the inner thoughts. Now I’m intrigued by Sara and the stakes for her. So, great 8!